A couple of years ago, I got it in my head that I needed an upholstered chair in my kitchen. Of course, like everything else in this little cottage, it had to be the right size to fit. After an exhaustive search, I found one on Ebay for a song, but let's just say you get what you pay for. It has ripped so many times, I've lost count. It is hard to replace because of its size. So over the years I have patched it and partially slipcovered it, but today, I think I've finally fixed it for good and in the meantime, ended up with a gorgeous custom chair, if I do say so myself. Want to make your own? Don't sew? No problem. Just follow along, it's an easy DIY, I promise. This is Exquisitely Unremarkable, remember? This is where I started today. Under the red fabric is another huge hole. This chair was a mess and honestly everyone told me to throw it out. It was junk, but I just couldn't. This post contains affiliate links. Please see my full disclosure. Repairing that tear had me stumped. When I reached out for help, lots of people suggested little arm covers. Unfortunately, the arms of this chair are not really pronounced and there is an odd diagonal seam, so covers would not work well. However, my friend Nancy sent me a link to a makeover she found where the woman used Fusible Bonding Web . It was worth a try...so after examining my craft box and my options, I decided to go that route. Thank you, Nancy. I started by tucking a large piece of fabric in on all sides of the chair. I wrapped it around the arms and cut off the extra. 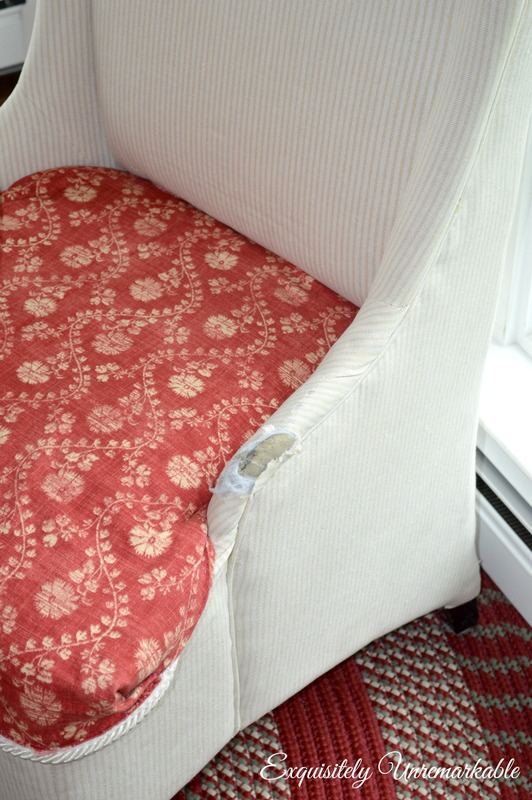 When it was firmly in place, I cut strips of the fusible tape and secured the fabric to the chair with the iron. I have an iron that I use just for crafting. It's totally clean, but you never know when you're working with glue, etc. I started with the iron and the tape, then switched to a staple gun to shape the arms. I pulled the fabric very taut in both cases, alternating sides, until I achieved a very snug fit. I used a very generous amount of the tape. I wanted the cover to be very secure. We really sit in this chair every single day and I didn't want to worry about it slipping around under...pressure. I followed the instructions on the package at first, but then I ditched the damp rag they suggest using in between the iron and the fabric, because I needed more heat. I tested it in a small spot. All was well, so I kept going. Once the fabric was completely bonded to the chair, I moved on to the pleated skirt. Ok, funny story about the pleated skirt. You see, a while back I replaced the fabric on my glass cabinets. Not wanting to waste the old fabric, I started making a scrap style valance for my kitchen window. Unfortunately, I kept running into design problems, got frustrated and tossed it in the craft box for a day when I had more time to work on it. Well, today when I was digging through that box I found it and a lightbulb went on it my head. I would skirt the chair with it. Now, I did sew these piece together, but you don't have to if you don't know how...or don't want to. 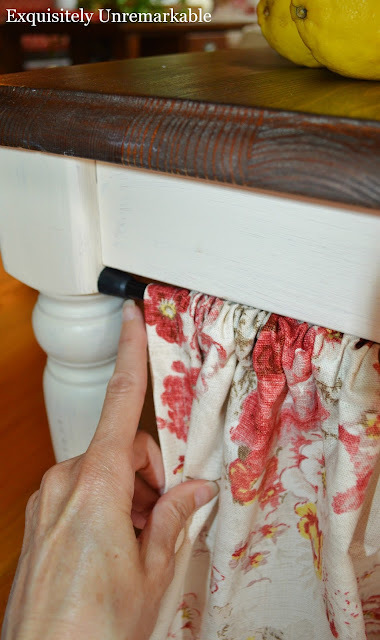 The fuse tape will work to join your fabric strips. I also hemmed the bottom with the machine, but again, the iron method will work fine. I used that tape to attach the skirt to the chair, pleating and ruffling the fabric as I went along. It was much easier than I expected and I was done in a flash. ...and a lot of the fuse tape. 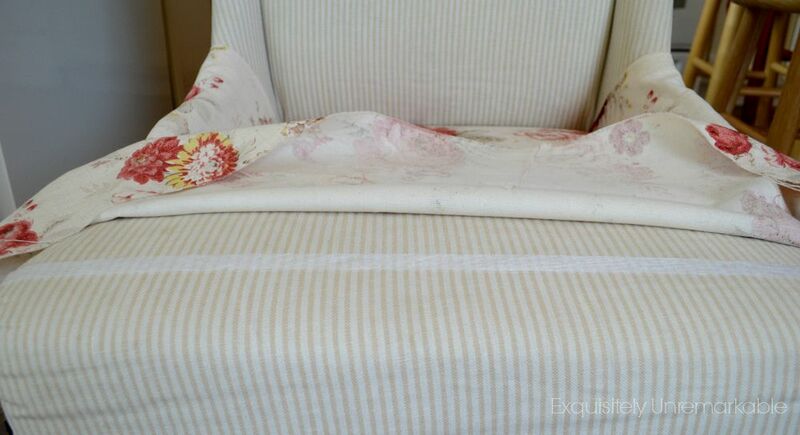 With the skirt firmly in place, I was ready to add some trim to hide my "seams" and give the entire chair a more polished, custom look. My best friend was needed for this job. Yup, it was my trusty glue gun to the rescue. I have been hot glueing fabric to fabric for years and I have never had a problem with it. It holds up and if it does get a little loose, I just add more glue. I have to say that I am very pleased with my new chair. I have always been smitten with mixed fabric upholstered pieces and now I have one of my very own. I actually like it better now than when I purchased it. Although, I could've done without all the nasty holes it took to get here. I think this method would work well on an ottoman, too. How cute would that be? Might have to make myself one of those next. How about you? Are you tempted to fuse and glue yourself a custom piece? Check out some more easy sew or no sew projects and be sure to visit me on Facebook! Oh my word! It's beautiful! Genius idea and it looks amazing! Kim that is absolutely adorable! 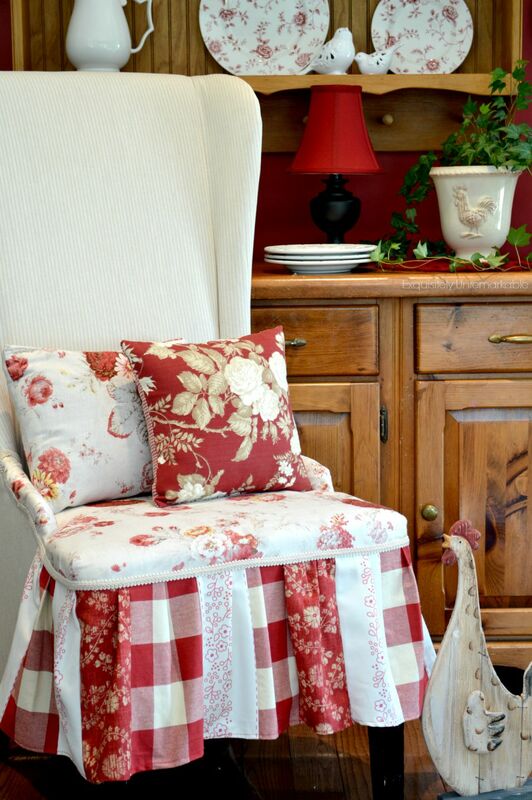 The combination of the fabrics is so wonderful and cottagey. I've always loved the look of mixed fabrics and wish I had something like that myself. I love it! You and your glue gun are rock stars! Thank you, Stacey! I really like this one! I went into a bit blindly, but it worked out well and honestly, it only cost me two bucks, since the fusing tape was 50% off! Not bad! Look at you...so clever! Great fix Kim and even someone who doesn't sew (me!) can do this. It's an easy one, that's for sure! ;) It's proof that fabulous doesn't have to be complicated! That is just beautiful. I have an old wicker rocking chair in my kitchen by the sunny window...but a white chair wouldn't last a day here. Between the sand, Joe, and his boys....not to mention me....I envy your ability to pull that off because it's just gorgeous. Benita, you are so nice to me! 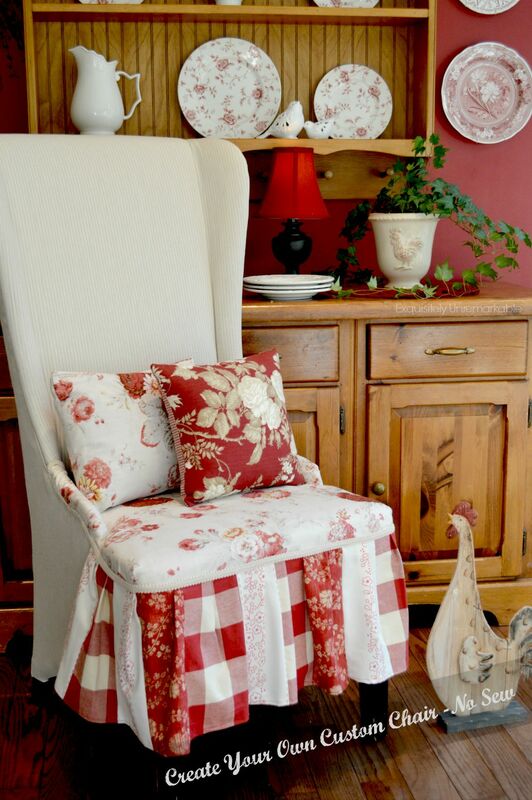 I do love this chair and that fabric. I feel in love with it when I saw it at Jo-Ann’s and had to have it. It’s an oldie, but a goodie! From that one purchase, I have skirted a end table, made pillows for my living room and now customized and repaired my chair. I probably have just enough left to do your footstool! ;) You can do it though, I have faith! Go get some fusible web and start ironing! Great job Kim! 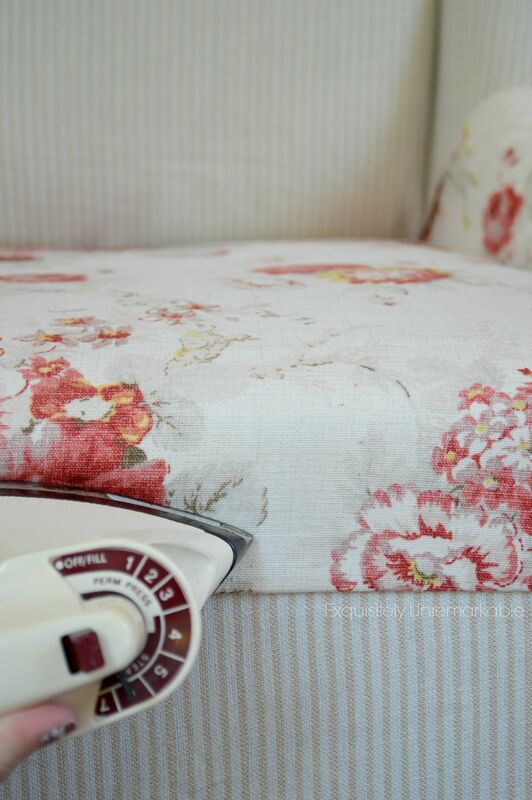 And I'm totally impressed at the pictures you took while ironing one handed. :) You make it look so easy. That skirt is just lovely! Oh be still my heart!!!!!! What a delightful chair makeover. Just super precious. LOVE it! 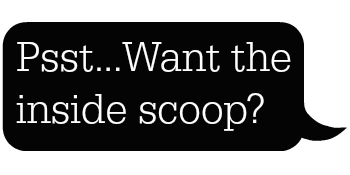 But to be perfectly honest (-grin-), I'd not have the gumption to attempt such a task. But you did and it came out purrrrrrrrfectly. And Congratulations to the winner!!! Thank you, Tessa!! I wasn't sure that I had the gumption for this one either, but I have really wanted to fix this chair for a while. I kind of dug in without a plan, but I think it worked out ok! That chair looks absolutely gorgeous!! You did an amazing job on it! 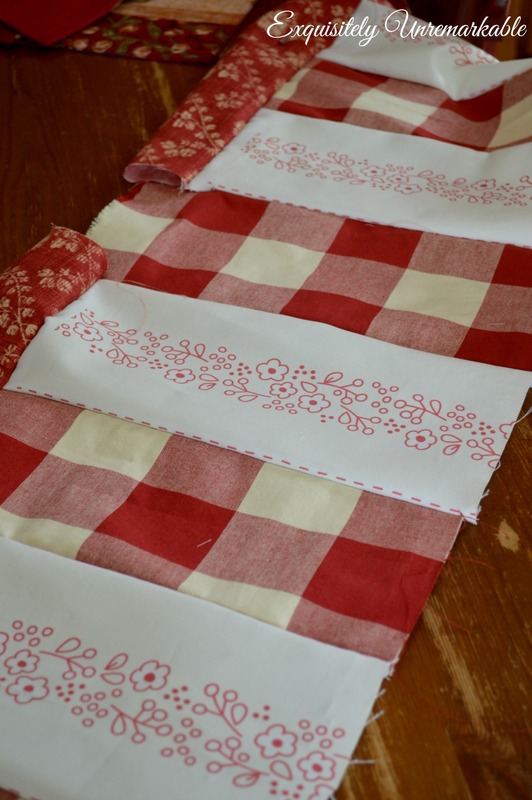 I also love the red and white color in the various patterns; so darn beautiful! It is just gorgeous. Very nicely done. Absolutely amazing Kim!!!!!! LOVE What you did, it even looks better now than before! Good Afternoon Kim, Your chair is fabulous, I love it and you have made the renovation look so very easy. The colours you have chosen are perfect and like you I adore the mix of colours..... I think you can tell I really love your chair. To be honest with you, I had never thought of using fusible web, but I certainly will in the future. Enjoy sitting on your beautiful new chair. Thank you so much, Daphne! I do love the color combination and the mixed patterns. The fusible web was so easy to use, it really made this project a snap. I highly recommend it and I will certainly use it again! Thank you Christine! I am pretty impressed myself! I wasn’t sure I was up to this task. Turns out it was way easier than I has anticipated. OMG!!! This is awesome!!! !$ you rock girl!!! This is awesome, Kim---such a gorgeous chair and you dressed her up perfectly! Great instructions, I love that fusible tape as I can't sew on a machine. It's a lifesaver. Bravo to you, that's one pretty chair! This is Exquisitely REMARKABLE ! I remember when you were trying to decide what to do and it's good that you held off until truly inspired as this is just gorgeous! Now it's too pretty to sit on anymore, lol! Looks great, a super mix of both material and colour. Your chair is fabulous! I would think it was a professionally upholstered chair in a great chic little shop. I love the colors and the fabric. 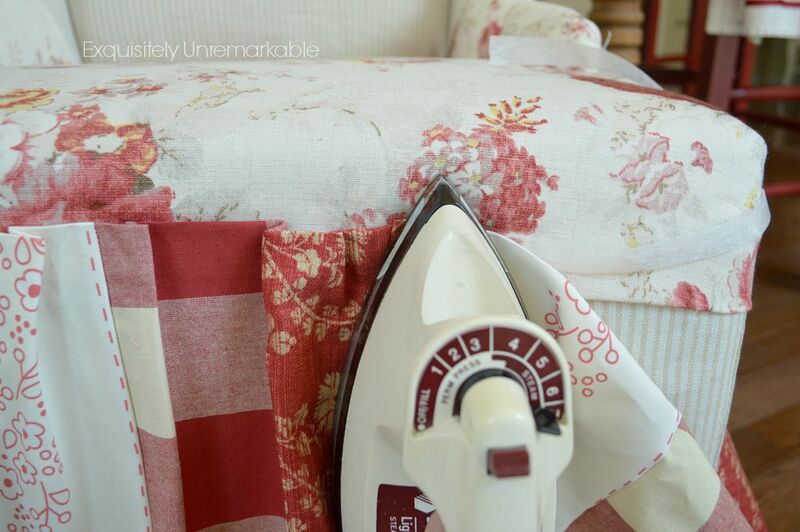 I have worked with that fusible tape before and never again! I had to buy a new iron after and that is all I will say about that!! Hi Kim, this is gorgeous!! You did an amazing job making this look custom made which it really is now!! When I first saw this in a previous post, I thought this would be the way to go. 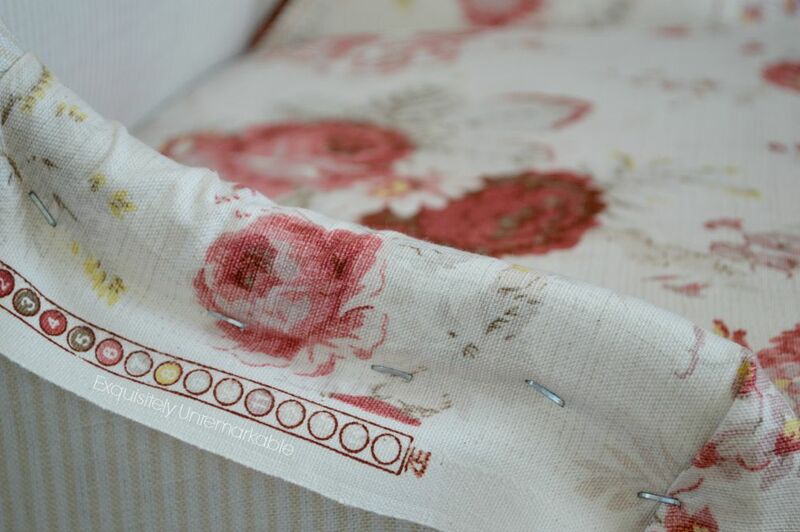 I have this same old rosefabric in my red guestroom for tab curtains. You did a fabulous job and it looks amazing. The added skirt is the perfect touch. You are so talented. Magazine worthy for sure!! You have just made my Saturday, Celestina Marie ~ so many lovely words here! :) I am very happy with the chair now. It’s almost too pretty to sit in! ;~) That rose fabric is one of my favorites. I used it to skirt a table in my living room and had just enough stashed away to make this project work. I was a little nervous to try, but I am glad I gave it a shot. It really was so easy. Pretty project, Kim. 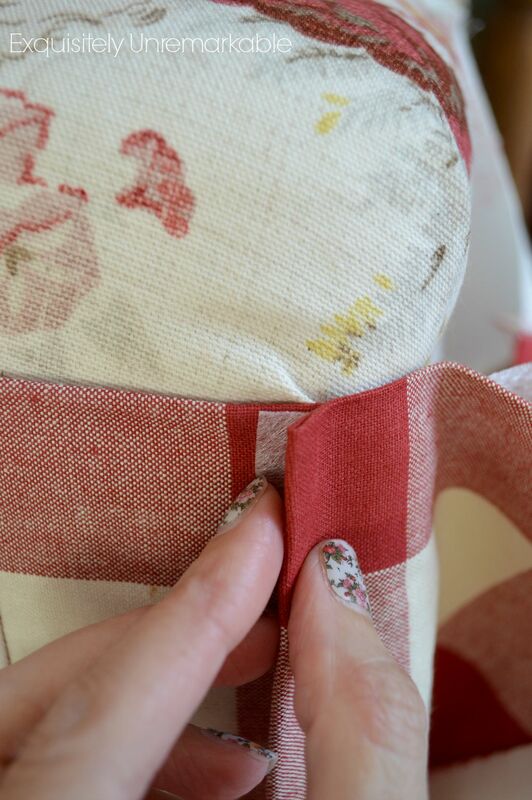 And would some of that leftover cute red fabric work on some toss pillows you've got laying around? Hhmm. How wonderful that you were able to fix the chair and make it beautiful and NOT throw it away! Good for you Kim. Thanks Ronda. Throwing it away was not an option! I really like the size and style of the chair and it is very comfy. The fabric is just cheap and thin. 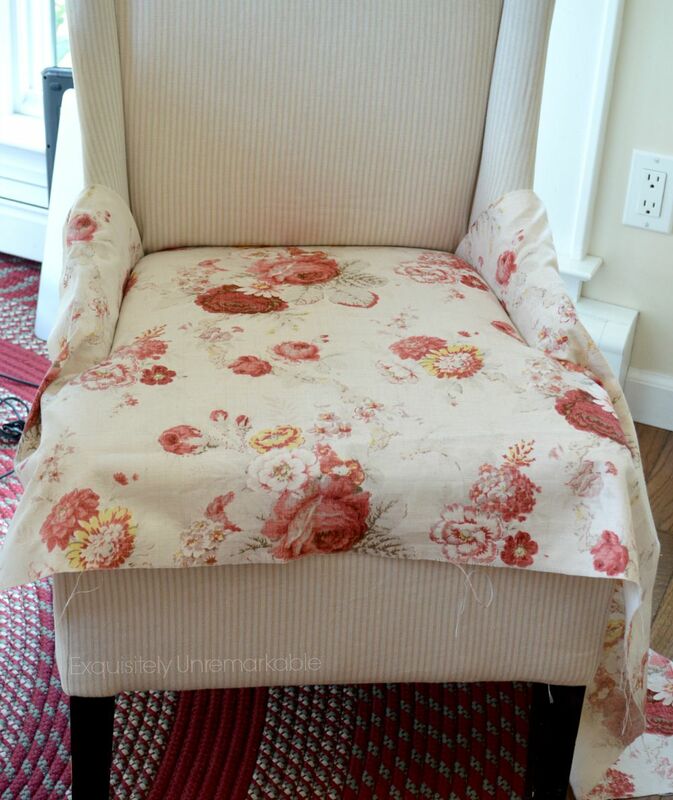 I am glad this worked, because the next option was a slipcover and given the unique shape of the chair and my lack of advanced sewing skills, I would’ve had to pay to have one made and that gets pricey!! Your chair is so, so gorgeous! You did an amazing job repairing this unique find! A great job! The chair is beautiful. My husband and I tackled reupholstering my Grandpas old rocking chair. We did it, but this idea would have worked a little better I think. I just don’t think I have it in me to actually reupholster anything, Carla! My husband and I did discuss it, but then I found the glue post and I was sold! Kudos to you and your hubby, I bet your grandpa’s chair is darling! That's so nice Laura! I love getting pinned! Connie, you are just so sweet! Thanks so much for the lovely words. You should try the chair idea, it was super easy, I was pleasantly surprised! I am off to check out your giveaway. How fun! That turned out so cute, Kim! It almost looks like the chair is wearing an apron. Hope you're having a great Sunday! Hello Rue! My grandmother always had a couch in her kitchen and I thought it was the coolest thing. I just have a chair, but I do love the softness it brings to the room and my tail! ;) You know I love aprons, so you just made me smile! Inspiring you are . . . 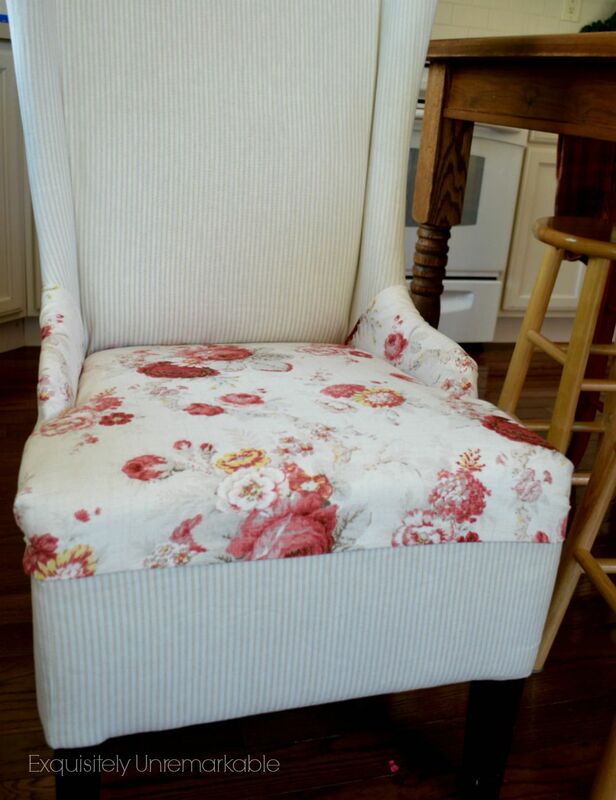 Mighty fine reupholstered chair for the kitchen! Makes me want to tackle a couple of wing backed chairs I have tucked away! Love the fabric choices... it came out great! I always get nervous upholstering furniture. You did a great job. I love the fabrics you chose. I don't sew so I need to hang on to this idea! It was very easy, Janet, I say do it, if you have the chance. It was fun to create something new! This a great transformtion and very well explained... And your nails match the new fabric! Thank you, Magali! I am glad you understand my directions, I am always hoping that what’s in my head, makes it on the page in the same way! ;) Thanks for noticing my nails, too!! Super job. I love the look! Thanks Carol! I do, too! Oh my gosh Kim, you are killing me girl! 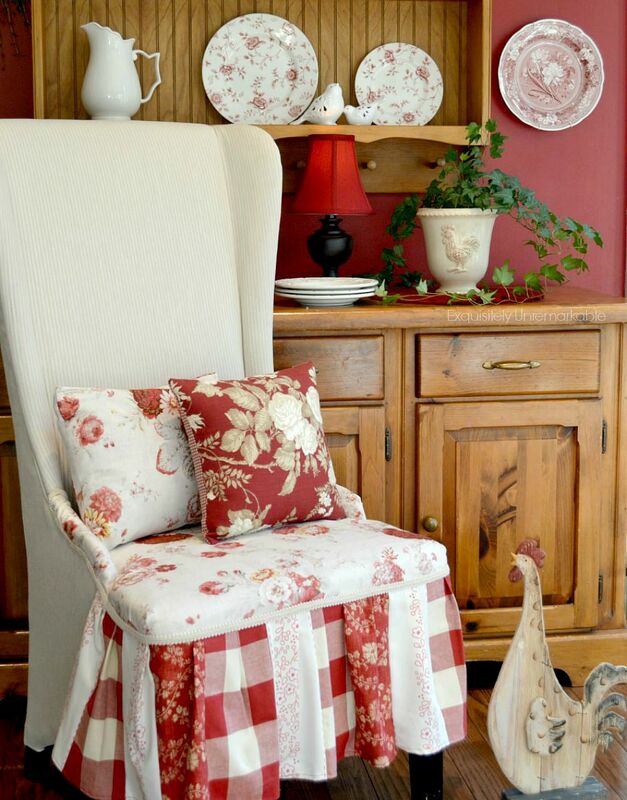 You know my weakness for red and I adore the cottage feel this chair has!! The pieced fabrics are fabulous. I have used heat and bond and fusible web, but never the tape. It worked fabulous and I love the trim!! Thanks for sharing with SYC. I may need to add a ruffle to my ottoman. Haha, Jann, you are too funny!! I know, the red and the mixed prints. I really like it, too. I won't let anyone sit in it yet. Just me!! I have to say it was really easy to do. I expected a big mess, but it was super simple. Thanks for the party and for always popping by. You truly are the hostess with the mostest!! Darling. I love how you did this, so unique. Thanks for sharing. This chair is so darn cute, Kim! 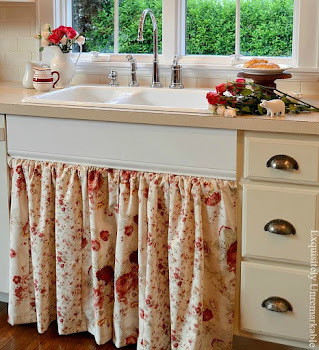 I think your idea of using the valance is absolutely perfect. Great job, Kim! Hello, What a great idea! Love your colors and I have never tried the fusible tape and I liked how you said you have two irons one for crafts and the other for the clothing. The red and white is just charming and very cozy! Thank you, Roxy! I am a red girl! Yes, I learned the hard way that a crafting iron is best used for just that and that alone! ;) Thanks for the visit! Oh my I never thought there was any other way other than a whole chair upholstery or chalk paint. I can see I need to read about all your other projects. You are brilliant! Oh my goodness, you are so nice! I was pretty impressed with how easy this was to do. I really thought I was going to have to reupholster or slipcover it, for sure! Oh my Gosh! I love that chair. 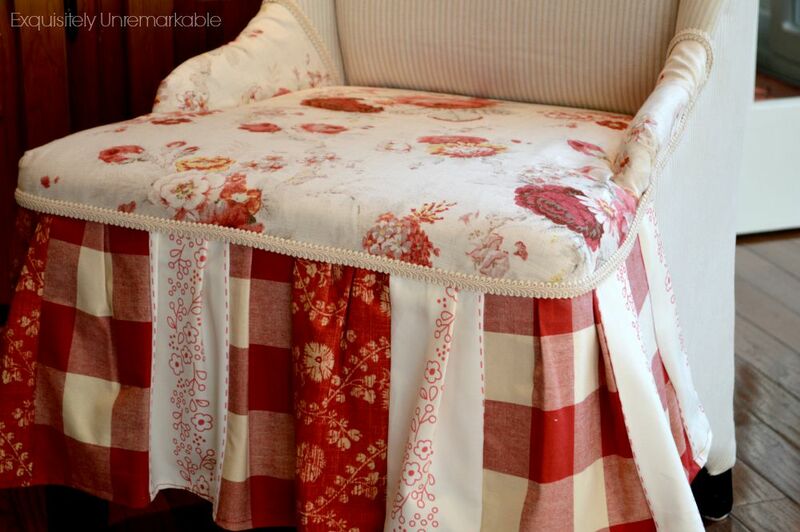 And wow, what a neat way to upholster. I hope I dare do this on a chair of mine. Thanks for sharing. Thanks so much for popping by to peek at my chair and leaving such a sweet message. It was very easy to do and it’s been holding up just fine! I highly recommend the process! Thank you, Nitka! So many nice words! It's lovely! You rock on the frugal ideas front, girly! Kim that is super cute!! Love how you did this!!! Thanks Sherry! It was a lot easier than I thought it would be and the results are much better than I imagined. Hi Kim, This is Theresa from Shoestring Elegance I LOVE your chair and the great lengths in which you went to show us how to do one ourselves! It's beautiful and I have already Pinned!! I would love and be honored if you would come link this up to my What to do Weekends Party! This is exactly the kind of projects I love to Feature!! Our party just started, I hope you will join us! Happy Friday! Thanks Theresa! I love a party, I'll check it out! Guess what, Kim?! You're my personal Bonus Feature tonight @ the party! Thanks so much for sharing with us! I Love this chair!!!! 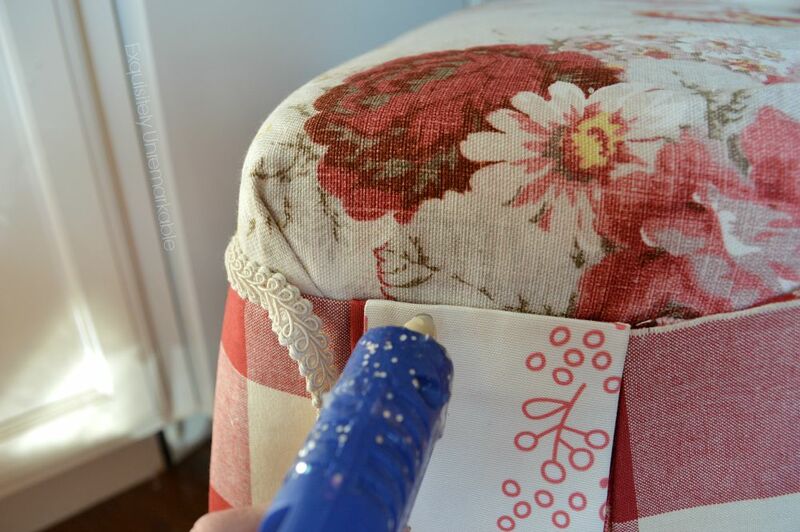 I recovered an old thrift store find, but I would have never thought to use fabric bonding tape or a hot glue gun. How ingenious..wish I would have thought of that. It would have made it so much easier. Thanks for sharing. I'm late seeing this but it was too amazingly beautiful for me to leave without commenting..
Sonny, thanks for the super sweet comment. I really appreciate it. I was very surprised how easy this project was. I expected it to be much more difficult. Good luck with your chairs and ottoman. I bet they’ll be fabulous! Adorable! Great job! Thanks for the DYI!,!!! Love it! Soooooo cottagey ! Is that a word? Ha! This looks gorgeous and great tutorial. You're my feature pick at this week's Talk of the Town party at Knick of Time. Thanks for linking up! My first visit and I have to say your chair caught my eye immediately my favorite color. Great blog and a beautiful job. Your chair turned out beautiful! I love the patchwork design. You make it look pretty easy. I have a couple chairs that are faux leather that the cats have scratched up some and would love to recover. We sit in them every day. 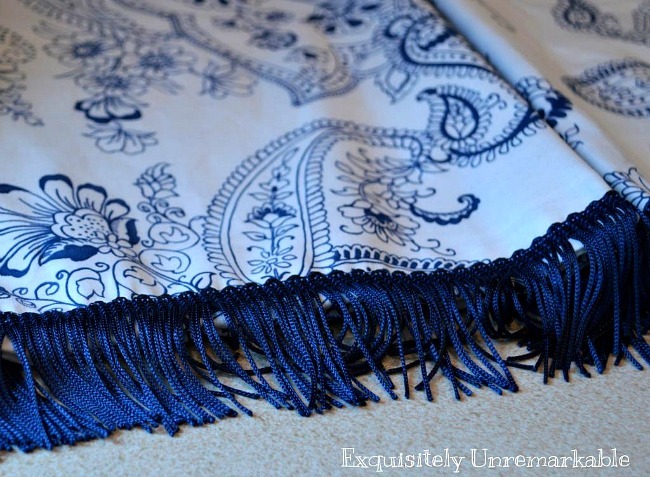 Would love to put a fabric that wouldn't get scratch up so easy, but I'm not so sure I am ready to tackle that job. I'm afraid to spend the money for the material then mess it up. Thanks so much, Linda. Yes, I totally understand. I was not too sure about this project either. It was easier to attempt it, because I had the fabric on hand. I am not sure I would've tried it if I had to go out and buy fabric. Reupholstering and slipcovering intimidate me! This chair is amazing and I love the tutorial. 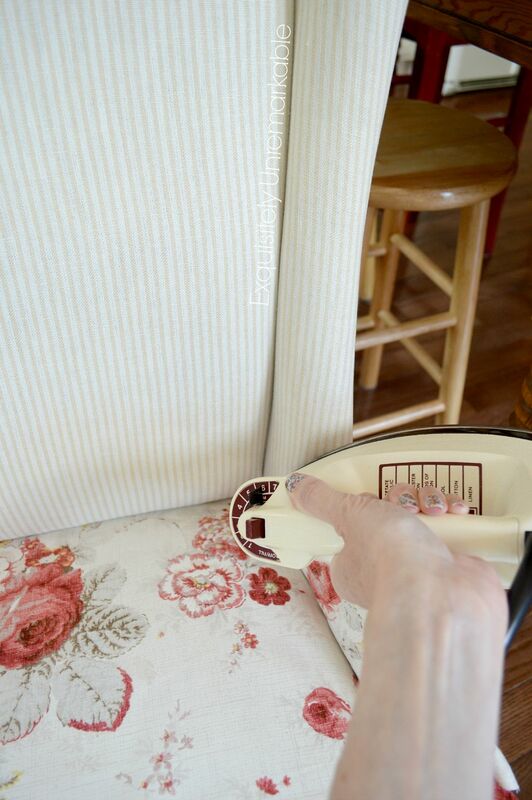 What a quick and easy way to change out your chair. Thanks Bev! It was so easy, I was surprised and very happy with the result. :) Thanks for the visit today! Oh my!! Thank you for that! Never knew I could use fusible tape for that! I have chairs that I've covered here and there that need a little help!! This will solve it all!! Thank you! Your chair is totally adorable, I love it! I was so excited to find out about the tape, Nancy. It saved my chair and really prettied it up! Hope it works for you! :) Thanks for the comment and visit! 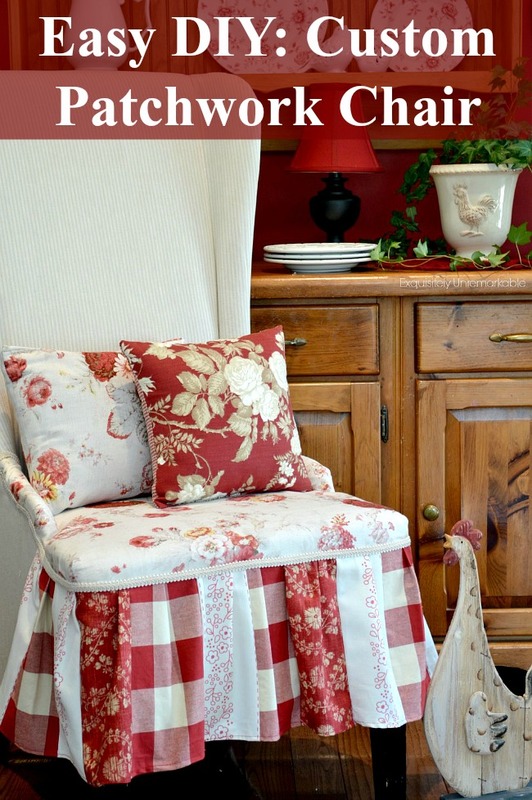 Though I do sew and have been looking at my two sewing room chairs for a long time as to how to recover them, I may have to give this method a try. It's genius! Thank you for sharing this wonderful idea! Wow, what a great makeover. You saved youself $400 by avoiding a professional upholstery job, and it looks beautiful! Thank you, Toni! Yes... It can be so expensive and that was going to defeat my original goal of getting a bargain chair!! Super cute makeover Kim! I love the fabrics you used. I really like this idea. I have a couch that I love that the cats have damaged a little on the front sides. I will try to use your idea here to fix it. Thanks for your clever idea. Very beautiful!! Saw this on Hometalk! Pinning for inspiration, thank you!! Great job. It looks very nice. So cute and cottagey. The mix of fabrics really looks fantastic. Wow! What a beautiful transformation. When I first saw the chair, I thought that it was professionally upholstered, but following your post you made it look so simple. I've always wanted to get my 6 dining room chairs 're covered, but could never afford to pay someone to do it. Thank you so much for your lovely words. I am so glad that you found some inspiration today. It really was a simple project, trust me, I am not that talented! 😉It just took a bit of time and patience, but it has held up beautifully to a houseful of rough teenage bottoms and in a kitchen as part of our table seating. If you do decide to do it, please let me know. I would love to see the transformation! Good luck!! I love what you did to the chair Kim. You've given it so much personality and charm. I have this thing for patchwork stuff, I think it reminds me of a patchwork quilt my Ouma made for me when I was a child. I still have scraps of it in my closet :D It's too precious to throw out. Using fuse tape is such a great idea too. Tring to sew that lovely skirt would have put me off completely. Michelle, thank you so much. I have a thing for patchwork, too. I love that you have the scraps from your Ouma. And trust me, my sewing isn't that great. Don't look too close...Ha!